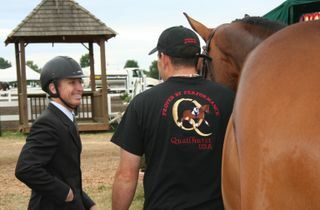 A strong element of the Quailhurst philosophy is to produce and develop horses that have the temperament, conformation, and athletic ability for both dressage and jumping. We use free jumping as a part of the program for our dressage horses and our U.S. based stallion, Caletino, recently debuted quite successfully in the jumper ring, with U.S. team rider Rich Fellers in the irons. 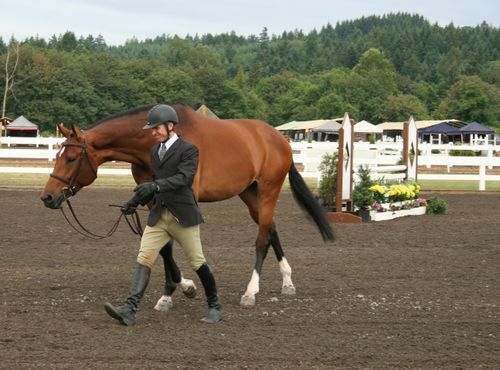 Continuing this vision of a well-rounded education for the young, modern sport horse, we recently took our four year old mares Abamba and Alexiss to the AA rated Country Classic Hunter/Jumper show at the lovely Hunter Creek farm in nearby Wilsonville. Our initial plan was to simply use the outing as a chance to school in new surroundings, but we then decided to enter Abamba (Samba Hit x Ulocia x Goodtimes) in the four and five year old model (in hand) class. Our good friend Rob Perkins of Arbor Grove Equestrian stood her on the line for us and Abamba received second place in the class. Thank you Robbie for a job well done!